I’ve been to Crumbles ‘n’ Cream a couple of times for their ice cream. It’s a pretty small chill place and the ice cream isn’t bad at all with each scoop costing #400. The last 2 times I visited they had taken the ice cream tubs to the back freezer and forgot to bring them back in after power was restored. The ice cream came out melted. 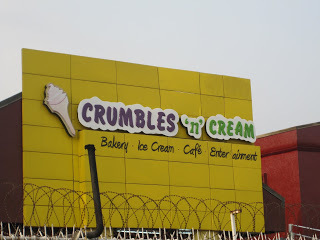 A few days back, I was craving some baked goods and decided to try out Crumbles. I ordered the Red Velvet Muffin (cost #350) and it was awful! It was as hard as a stone. My friend got the Blueberry Muffin (cost #350) and it was pretty bad too. It tasted nothing like a muffin and was just very disappointing. We had to ask them to warm up the muffins to be a little palatable. This made the muffins edible but couldn’t mask the fact that they were just poorly made. Refusing to believe that Crumbles ‘n’ Cream couldn’t deliver on tasty treats, I decided to try their double chocolate chip cookie which cost #450 – and it was the worst!!! It tasted like a mixture of sand, flour and sugar that wasn’t baked long enough. I ended up spending wasting a total of #1150 and trashing all the stuff we bought. So much for baked goodies. I was so very disappointed. Crumbles ‘n’ Cream also offers delivery services. Been there too. Ure so right. Guess nepa is to blame. For the icecream sha.